Is it toe-may-to or toe-maa-to? It doesn’t take much to make tomatoes tasty . . . a sprinkle of salt or sugar . . . a blop of mayonnaise. We had a friend in Canada who, judging by how much he used, liked salt more than he liked tomatoes. Remember the saying, “You can’t see the forest for the trees”? He had, “You can’t see the tomato for the salt.” That’s overkill. A confession. Raw tomatoes are one of the few foods I don’t like. Cooked tomatoes— that’s another story. And sun-dried tomatoes are super. Fried green tomatoes, they make wonderful bases for first courses. The British serve fried tomatoes with breakfast. You can do it with lunch or dinner. Depending on how dry you cook them, they can be the top part of a warm salad too. Grilled cheese and tomato soup is a soothing combination— with soup that most often comes from a can with a red and white label. How about a couple of simple changes to make it fit for company? Peel a tomato, squeeze out the seeds and chop it. 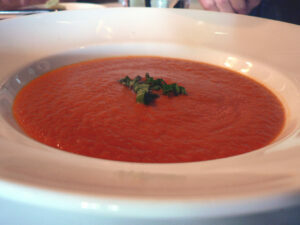 Add the tomato to simmering soup and let it soften. Just before serving, add some chopped basil. 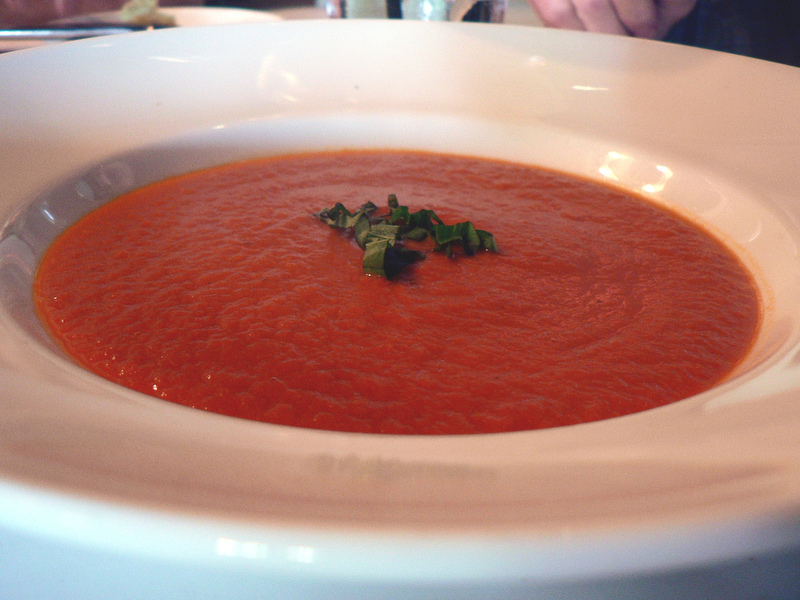 Now you have tomato-basil bisque. Serve it with sandwiches made with brie and blue instead of cheese slices. Oh! How fancy. Lots of people got small appliances for Christmas. I got a quesadilla maker that has been used just a few times. Haul yours out and slide some tomato slices in with the cheese, fresh herbs, and pepitas (pumpkin seeds) or sunflower seeds added for a little crunch. Fresh tomatoes are the base of the salsa or pico di gallo that go with the quesadillas. When your garden runneth over with tomatoes, or they are on sale at a store, set aside enough to dry your own. Put a manageable piece of light wood on a picnic table and top it with wax paper, cover it with a few baking racks or cooling racks and spread tomato slices on the racks. Cover the whole thing with cheesecloth to keep the bugs at bay and let the sun do the rest. Bring them in at night. For a side dish, how about frying a can of drained chickpeas a few minutes in a little olive oil until they get just a touch crisp? Then add slices of plum tomato, some cilantro, lemon juice, salt, and pepper. Sprinkle with feta cheese just before serving alongside meat or fish. 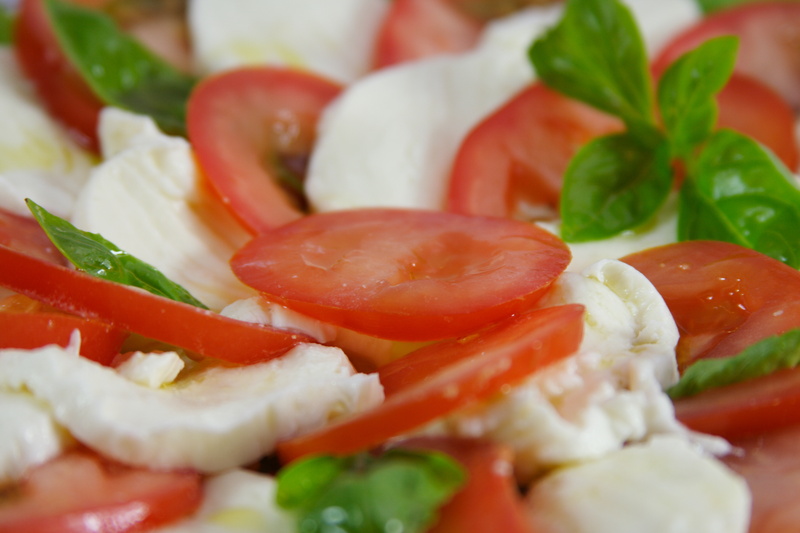 Slices of tomato and fresh mozzarella is a frequent first course in nice Italian restaurants. It’s called caprese and includes a drizzle of balsamic vinegar. You can make a variation of it in a sauté pan. Fry the slices in olive oil, then layer with mozzarella on crispy bread, drizzle with the best balsamic vinegar you can afford, and sprinkle with fresh herbs. On a more serious note, there has been a move afoot in recent years to help tomato pickers make a living wage and have improved working conditions. End-use buyers, including some restaurants and retailers, agree to pay an extra penny a pound with the money increasing wages for the mostly-immigrant pickers. It is called The Fair Food program and includes Burger King, Chipotle Mexican Grill, McDonald’s, Subway, Trader Joe’s, and Whole Foods Market. Wal-Mart Stores joined the program in January. Our state is behind only California in tomato production, with about 33,000 pickers harvesting more than $600 million worth of tomatoes.